A year ago, when the water shortage was becoming acute, Californians passed a $7.5 billion water bond, with nearly $3 billion slated to go to water storage, which most people read as dams. But despite the passage of the proposition, Californians are still arguing over whether to build dams and which out of several proposed to construct. Tuesday on the PBS NewsHour, I’ll be reporting on the dam question, and how it has become a real issue as the drought has worsened. While looking through some archives of the Department of Water Resources I came across a group of black and white photos that evoked a flood of memories. It was the 1968 dedication of Oroville Dam on the Feather River — still the tallest dam in the United States, a major piece in California’s State Water Project. As a 30-year-old reporter for KCRA TV in Sacramento, I was there, as was Gov. Ronald Reagan, and ex-Gov. Pat Brown (father of current Gov. Jerry Brown), since he was regarded as the father of California’s extensive water system. It was a joyous occasion, full of hope. And it may have been the last time that nearly everybody agreed it was a good thing to plumb the whole state and tame the natural rivers. I worked on a documentary that year that essentially showed all the good the water system was bringing to the state. I’ve been covering California water issues a long time, and I’ve been interested in the topic even longer. I remember that in seventh grade social studies in San Francisco, a student teacher led our class through a whole semester on the California Central Valley Project, the federal program to build Shasta Dam and several others, and send water south through a federally funded canal. We didn’t hear about any opposition. But shortly after Oroville got built, California seemed to embody with increasing vigor the old saying (sometimes attributed to Mark Twain) that “whiskey is for drinking and water is for fighting.” The usual adversaries were the north, where most of the water falls, and the south, where the people and the farmers are thirsty, since they built their cities and ranches essentially in the desert. It was always a tough sell to get the north to agree to send its water south, but it happened, creating one of the world’s great plumbing systems. Then, in the 1980s, politicians proposed a canal around the periphery of the Sacramento-San Joaquin Delta, where most of the state’s water naturally flows on its way out to the ocean. The so-called peripheral canal would have made it easier to get water south, supposedly with less disruption to the ecosystem of the Delta. But the north wouldn’t buy it; they claimed it was just another scheme to steal northern water. Visions of Southern California swimming pools and lush golf courses — all filled with northern water — played heavily on the minds of Northern Californians. Voters turned the peripheral canal down. As the years went by, the water wars ebbed and flowed. Mostly flowed. The environmental movement came into its own, and dozens of groups like the Environmental Defense Fund and the Natural Resources Defense Council started questioning the never-ending thirst of the farmers and the Southern California cities. But big water users, like Southern California’s Metropolitan Water District – the MET – and the Westlands Water District in agricultural Kern County, used their power and influence to get the politicians in Sacramento on their side. For years they fought over the rules and the distribution and the price of water. Then came efforts to mediate the disputes and bring the sides together. Alliances between environmentalists and cities seemed to ease the rivalries for a while, and the federal government tried to bring peace to the warring factions. Now, however, the traditional split is as evident as ever. The environmentalists, the biology professors, the Friends of the River, the AquAlliance and others are pushing hard against new dams and new water to raise profitable crops like almonds. They say existing dams have already caused drastic declines in the fish population, especially salmon that go up California’s rivers to spawn. 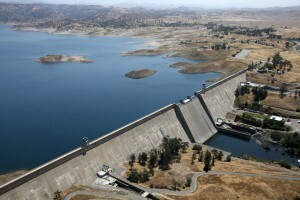 The farmers and the Southern California cities are pushing hard for more water storage, saying that in good, wet years the reservoirs can fill up and provide water in dry years. And they are pledging to try to recharge underground aquafers, which have become depleted as people draw more and more water from wells. The Brown administration and some water districts are preaching conservation and more reliance on these underground water supplies, but say that above ground storage is necessary to fill up the underground. And Governor Brown is advocating for tunnels, rather than a canal, to get water through the Delta and to the pumps that take it south. That battle is ongoing. In any case, it’s been a fascinating ride: great public works projects, water moving from north to south, and the whole state engaged in what seems a never-ending debate. Watching it, and reporting on it, could be a full-time job if everyone found the politics and production of water as fascinating as that teacher of mine who had a bunch of 11-year olds studying California’s water distribution for a whole semester. I wonder if anyone else was paying attention.